Graphical depiction of the Khoikhoi. In around 2300 BP (Before Present), hunter-gatherers called the San acquired domestic stock in what is now modern day Botswana. Their population grew, and spread throughout the Western half of South Africa. They were the first pastoralists in southern Africa, and called themselves Khoikhoi (or Khoe), which means 'men of men' or 'the real people'. This name was chosen to show pride in their past and culture. The Khoikhoi brought a new way of life to South Africa and to the San, who were hunter-gatherers as opposed to herders. This led to misunderstandings and subsequent conflict between the two groups. 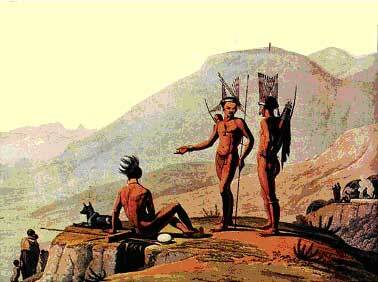 The Khoikhoi were the first native people to come into contact with the Dutch settlers in the mid 17th century. As the Dutch took over land for farms, the Khoikhoi were dispossessed, exterminated, or enslaved and therefore their numbers dwindled. The Khoikhoi were called the ‘Hottentots’ by European settlers because the sound of their language was so different from any European language, and they could not pronounce many of the words and sounds. The Khoikhoi used a word while dancing that sounded like ‘Hottentots’ and therefore settlers referred to the Khoikhoi by this name – however today this term is considered derogatory. The settlers used the term ‘Bushmen’ for the San, a term also considered derogatory today. Many of those whom the colonists called ‘Bushmen’ were in fact Khoikhoi or former Khoikhoi. For this reason, scholars sometimes find it convenient to refer to hunters and herders together as ‘Khoisan’. When European settlement began, Khoikhoi groups called the Namaqua were settled in modern day Namibia and the north-eastern Cape; others, including the Korana, along the Orange River; and the Gonaqua, interspersed among the Xhosa in the Eastern Cape. But the largest concentration of Khoikhoi, numbering in the tens of thousands inhabited the well-watered pasture lands of the south-western Cape. These ‘Cape’ Khoikhoi would be the first African population to bear the brunt of White settlement. Houses had to be very light and easy to erect and take apart. For this reason they were made of thin poles covered with reed mats. Even pots and buckets were made of wood with small handles to make them easier to tie to animals' backs. They also wore clothes made of leather, like the San. The animals, especially cattle, were a sign of wealth and the Khoikhoi only ate cattle that had died or had been stolen from their enemies. They only killed their own animals for important occasions like funerals or weddings. The women milked the animals and gathered wild plants from the veld and the men killed game for everyday food. This shows that the Khoikhoi hunted and gathered, but also herded animals. Khoikhoi society consisted of both rich and poor, as animals – which were a sign of wealth - could belong to individuals. This is because animals provided food, clothes and transport. This was completely different from the San, who were all considered equal and shared everything. Wealthier Khoikhoi people would share their milk with poorer members of their group, but would still be considered more important. They would also rub animal fat over their bodies to show their wealth. Khoisan languages, characterised by implosive consonants or ‘clicks’, belonged to a totally different language family from those of the Bantu speakers. In contrast to the San who spoke highly divergent languages, the Khoikhoi spoke closely related dialects of the same language. NÁ má, previously called Hottentot, is the most populous and widespread of the Khoikhoi and San languages. It belongs to the Khoe language family, and is spoken in Namibia, Botswana, and South Africa by the Namaqua, Damara, and Hai’om, as well as smaller ethnic groups such as the Khomani (to read more about the language see the history of the San). • The Khoisan from www.khoisan.org, especially the section on 'raiding'.